This is a fixture that can cement a player or a manager’s reputation for better or worse. For a débutante there can be no better way to endear yourself to the supporters than to put one past the old enemy. For a manager there is no greater responsibility than ensuring your army of fans have bragging rights over their neighbours. Down the years there have been many men in red who have gone beyond moments of brilliance, and who have embodied one of the fiercest rivalries in football. Here is my top 5 players, whose impact on the fixture transcends their time at the club. Crazy Horse’s contribution to Derby folklore is not about scoring goals. He did manage to break their hearts on the pitch a few times though. His brace in the ’73 game at Goodison will live long in the memory, with both goals coming in the last 10 minutes to secure a 0-2 victory. However, such an achievement pales in comparison with the six words uttered from the steps of St Georges Hall, that wound a whole generation of Everton fans up and still reverberate through the ages. 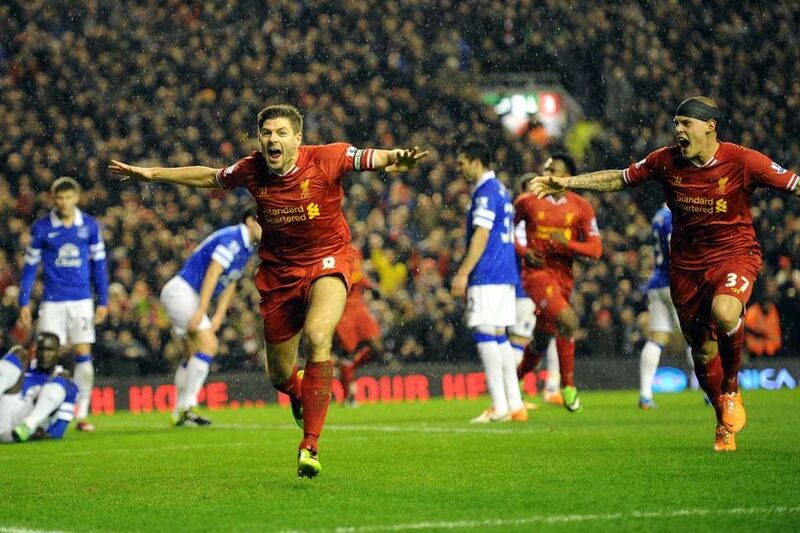 “Liverpool are magic, Everton are tragic.” My father-in-law, a bluenose, still moans about that today. Priceless. A lot of Blues had turned up to welcome the victorious Liverpool side home after their European exploits in ’77. Even Tommy Smith thought it was “out of order”. Maybe he’s right, but for me it sums up the spirit of the fixture, which is all about merciless banter. Neither side wastes many opportunities to rub the other’s nose in it whenever they can. Emlyn’s song, whether fair or not, is now part of the history of the fixture. Rushy is now famously fated in song, thanks to his exploits in the 5-0 trouncing Liverpool handed out to Everton in their own back yard. 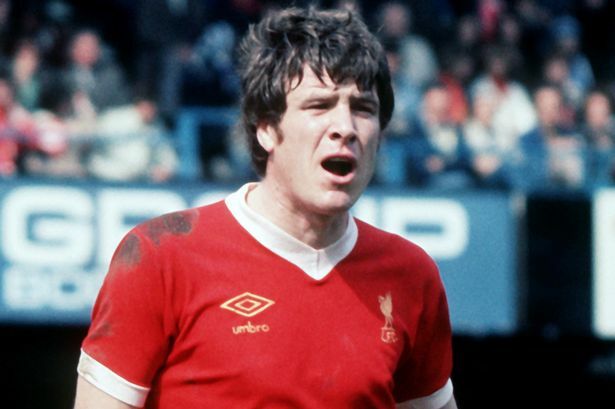 Rush tormented the Blues throughout his Anfield career. I’ll never forget the two extra-time goals he scored in the ’89 FA Cup Final, but there were so many more. In all Ian Rush scored 25 goals against Everton in two spells totalling thirteen years. This surpassed their legendary striker, Dixie Dean, own record by six goals. In my lifetime I have never seen a more prolific striker in a red shirt and his record in the Merseyside Derby probably won’t be bettered before I hang up my boots for good. Everton fans have penned whole stanzas devoted to ‘Stevie G’; possibly more than they have to Dixie Dean or Howard Kendall. They sing about him when they’re playing other teams – it is truly the bizarrest form of flattery. Never mind the fact that he sits at number four in a list of all-time Derby goalscorers; It is the fact that Everton fans descend into madness at the merest mention of his name, that puts him in my top five. It’s a real shame that Fowler’s career at Liverpool was cut short. I’m certain that he would have given Rush’ record a serious challenge, if he’d stayed at the club for the duration. Sadly it wasn’t to be. Still he manage six goals between 1992-2001, a very respectable return. Again though Fowler will go down in Derby legend, not for his goal scoring heroics, but for his participation in the ferocious banter that exists in the city. As a self confessed Everton fan as a child, who joined the Reds and became a legend, it’s probably not surprising that he induces such bitterness with the Blues. Throughout his spell with Liverpool he was beset with ridiculous rumours about drug taking. Every second taxi driver would regale anyone who would listen with tales of cocaine parties and worse. Fleet St. must have been gutted they never got a photo. Robbie’s response was utterly Scouse and completely wonderful. After bagging a brace in the Anfield Derby in 1999 he rammed the abuse right back down their throats to hilarious effect. The sight of Fowler racing towards the Blue contingent, before collapsing to the turf and pretending to snort the chalk line was hilarious. However, it was only half as funny as the apocalyptic reaction in the Anfield Road end. Nice one Robbie. Seriously though kids, Just say NO! Another player who invoked utter hatred amongst the ‘County Road Cutters’ was Luis Suarez. It was no wonder. 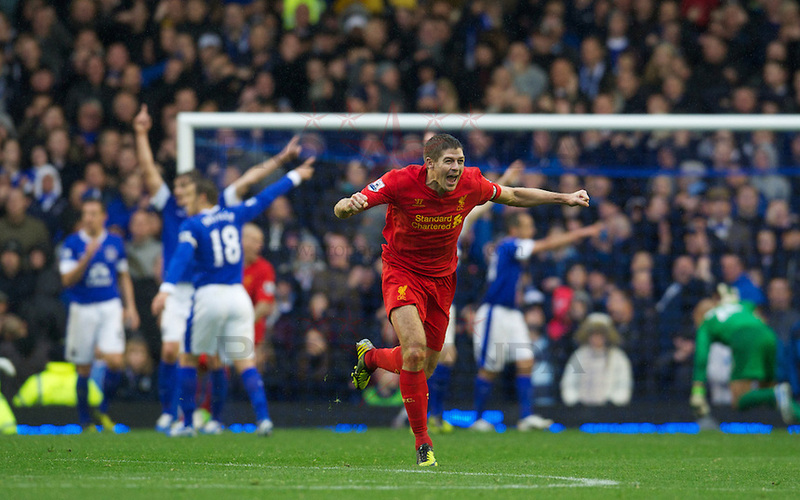 In just three years at Liverpool he put four goals past Everton and reduced their defence to a shambles time and again. 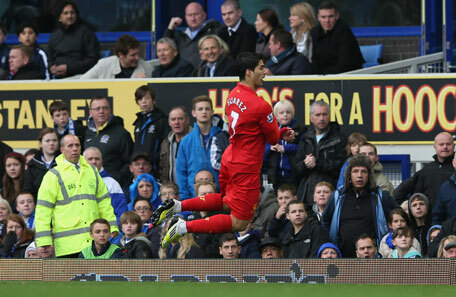 Some Everton fans were so sick of Suarez that in one game they threw money at him. Obviously they were offering to pay his air fair home. He had offended their delicate moral sensibilities so much, they even managed to forget the antics of ‘Psychopat’ and ‘Big Dunk’. David Moyes made the age old mistake of trying to wind Luis up prior to the 2012 Derby at Goodison and the Uruguayan responded brilliantly. After netting the opener he raced towards the dug-out, arms crossed against his chest and dived theatrically in front of the Everton manager. It was a hilarious riposte to Moyes’ accusations that Suarez was a diver and the Scotsman didn’t look like he knew how to respond. When Shankly took over at Liverpool he famously said that Anfield was the biggest toilet in the city. He had a huge task on his hands to transform Liverpool into a “bastion of invincibility”. Not least of his challenges was overtaking our nearest rivals. 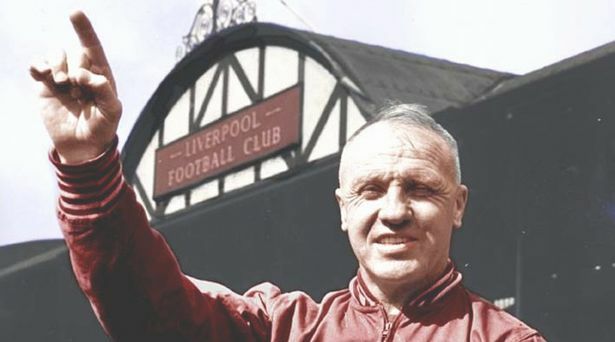 Shankly actually had a lot of respect for the Blues, but he felt that his Liverpool side had an inferiority complex when it came to their neighbours across the park. So he set about dismantling that and bursting blue bubbles. He must be the most quoted man in football. These days the internet is flooded with fake memes that attribute non-existent quips to this player or that. The beautiful thing about Shanks though, is that all of his are real. The great man went on to achieve his aim and the Reds emerged from their rivals shadow and went on to eclipse them totally. So on the eve of another Derby day encounter let’s celebrate a couple of absolute classics.